Hope everyone had a wonderful and blessed Christmas! Sending you much love and many blessings for the holiday season and for the New Year. In between preparing for the festival of desserts, singing in the choir, checking out a couple of concerts, and entertaining friends, I have not done much blogging lately. My Christmas was very quiet. I dropped off a friend at the airport early on Christmas morning then came back home and went to sleep for most of the afternoon. In the evening, I tried to play some of the Christmas music that I have not played this season. You can never play it all. Thanks to everyone who has made this year very special for me. May we all realize our unlimited potential in the coming year and may the music never end. 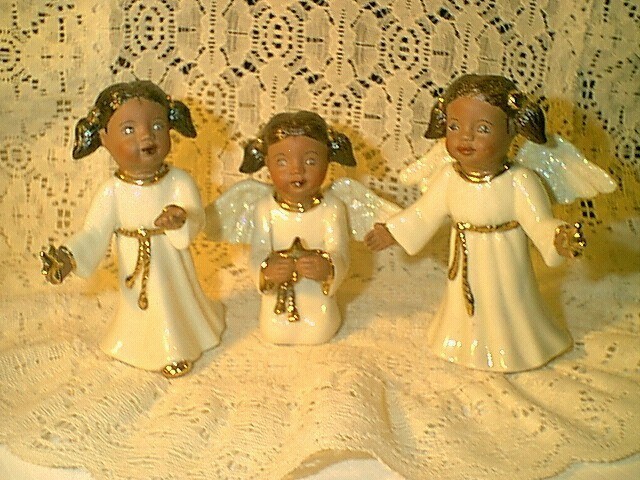 Special Shout-Out: The three angels were created and handpainted with loving care by my very talented sister-in-law and dearest niece. They will be coming to the web next year, I promise!!! This entry was posted on Friday, December 26th, 2003 at 7:15 am. It is filed under Special Feature. You can follow any responses to this entry through the RSS 2.0 feed. Glad that you had a good Holiday. Please add my name to the waitlist for the first shipment of Angels! i came here for a friday flashback! hope you didn’t get gain too much weight from those desserts *lol* but i do hope you enjoyed christmas. Your sister-in-law and neice are very talented. Coming to the web next year, eh? Does she need a webmaster? I’m open for business (heheheh). I hope you have a great New Year, James, and please try to do something on NYE. Way to go James! Didn’t realize you are a contributor, like this is your baby. I am going to bookmark the site and check into it periodically.